Eliana at the Forward on Climate protest in Washington, D.C. Growing up, my parents and my school have always fostered in me a love of the environment and an appreciation for Earth’s natural beauty, and I hope to find a way to combine my passions for environmental and social justice in my education and career as I grow older. I also do flying trapeze. In elementary school, my fourth grade class did a play about aliens who crash-land on Earth and meet some kids who teach them about the environment and sustainability. I was a wind turbine, and I still remember my one line: “We are wind generators, and we make enough wind energy to power this entire city!” I started to notice wind generators more after that, and I’ve felt a special sort of kinship with them ever since. Also, my dad has been involved in environmental politics for a long time. so there’s always been a culture of environmental awareness within my family. Before I was born, he did a lot of work with various organizations to get nuclear power shut down in California, and as I was growing up both he and my mom made it clear how important it is to care for our Earth. In February, I went to the “Forward on Climate” rally in Washington, D.C. because I was in the area visiting colleges with my mom. 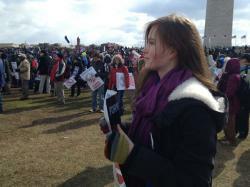 She’s always been politically active, and she wanted to take me to my first protest. It was incredible just to be at the rally and to see thousands and thousands of people who I knew were supporting the environment, supporting something I cared about. I’ve never looked out at a group of thousands of people before and thought, Wow, I really agree with all of you. Our shared values created this sense of community that felt great to be a part of, and having a community support a cause like that made me feel very good about all the choices I’ve made to protect the environment. I also remember going to the Goldman Awards and the Brower Youth Awards in middle school, and that was another turning point for me. It was pretty powerful just to see that there are youth who are capable of that kind of action, and it helped me realize that it’s really important to get involved in change. I now go to Lick-Wilmerding High School, which has a very low carbon footprint. The cafeteria has a zero-waste policy that includes composting and recycling as much as possible, it does not use disposable dishes or utensils, and the food is all fresh, local, and organic. While I’m not part of any environmental activism clubs, working for environmental and social justice is very much a part of the school culture, and I personally do my part by recycling and composting normally at home and choosing “green” products over less earth-friendly ones as much as I can. Kensington does not have a food scraps collection program, so my family also has our own compost heap in our back yard. The sixth grade curriculum at my middle school, Prospect Sierra School (a member of Green Schools Initiative’s “Green Schools Honor Roll” and a 2013 Green Ribbon Award winner), was centered around learning about sustainability. We visited local organic farms, watched The Story of Stuff, and learned all about the waste we produce and how our food is made. My sixth grade teacher, Kristen, was passionate about the environment, and along with all the other sustainability-oriented learning, we had a unit on factory farms. Learning about factory farms had a huge impact on me. I loved animals, so it was shocking to me to find out how terrible the living conditions are for livestock, and it also surprised me to learn about the negative environmental impacts of animal feeding operations. I became a vegetarian for a month in protest, and when I did go back to eating meat, I made sure that my family bought grass-fed or free-range meat as often as we could. I think we need to work as a generation and as a community with each other in order to solve the problems that other generations have failed to solve. There needs to be a sense of community involvement because if we work together with this, then we can make a change, and I think it needs to be something we are constantly thinking about because if our generation doesn’t do anything then it will be too late to make a change. It’s hard to know what you can do to make a difference as a young person. You can’t be a climate scientist right now, obviously, and it may be hard to find something meaningful that you can do. For someone who wants to help but doesn’t know where to start, my advice would be to get more information. I think that’s the key. Start paying attention when environmental issues are in the news, if there are rallies in your area, if there are people who you can learn from. Find people with similar interests. I think if we all just get more informed, it’s our natural tendency to get more involved. I hope to go to a college that has good internship opportunities, opportunities for me to create political, social, and environmental change, since those are things I think can be done all at the same time. I hope that I will be in a place that fosters that sense of trying to make a difference, where I’m around other people who feel similarly.